If your wedding has a beach theme or location, there are tons of ways you can DIY your centerpieces. Purchase glass containers from a dollar store and fill them with shells you’ve collected. Surround your jar of shells with starfish. 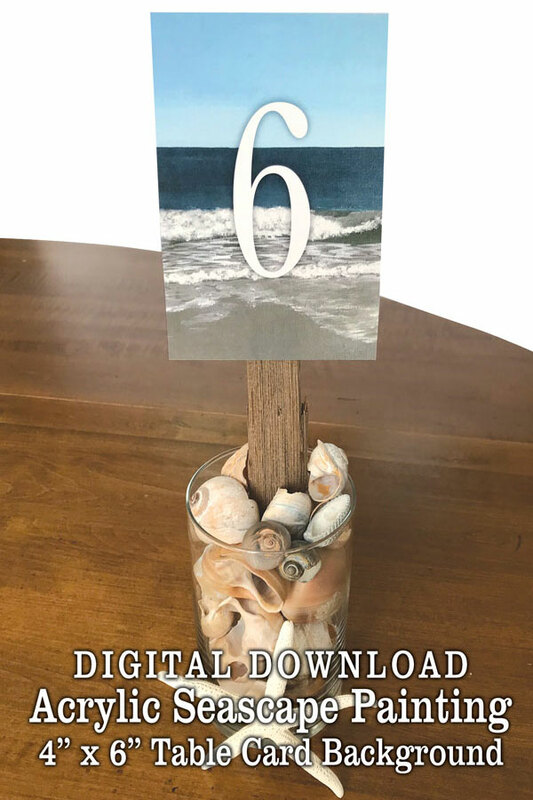 Attach a table number card to a longer piece of flat driftwood – placed halfway into the jar. The acrylic seascape table card is available for download in my Etsy shop. Most items you can collect on your trips to the beach, or you can easily find online or at your local craft stores. Browse my Etsy shop for a selection of downloadable art for your wedding table cards. Categories: Beach Weddings | Tags: beach, beach centerpiece, beach wedding, centerpiece, table numbers, wedding | Permalink. Thank you so much for your comment! I appreciate hearing that I’ve inspired you 😊 I just started the Etsy shop a few weeks ago. I’ve thought about doing it in some form or another since starting my blog in 2014. Now it feels like the time is right. My oldest is away at college. The time will come when you have more time! It’s a weird feeling as the kids need me less and less. Are you selling the fabrics you enter into the contests? Thanks again for reaching out. Hi Eileen, I have tried several times to respond to your comment on my blog…with no avail..🤔😔 so I reposted the post with pictures! Thank you for letting me know. I really love – wonderful and stylish idea for any boho/beach wedding theme. Nice idea!